A self-described “Texas-bred, Spirit-led, Bible-teaching, revival-preaching, recovering Southern Baptist,” James Milton Dunn, over the last fifty years, has been the most aggressive Baptist proponent for religious liberty in the United States. Soul freedom—voluntary uncoerced faith and an unfettered individual conscience before God—is the basis of his understanding of church-state separation and the historic Baptist basis of religious liberty. Through his ministry as a pastor, ethicist, and activist, James Dunn developed a distinctly Baptist approach to politics, showing fellow Baptists how to apply their Christianity in the public square on social and church-state issues in a manner consistent with the historic Baptist commitment to freedom. This ethic of political engagement promoted by Dunn was motivated by a loving concern for others and a commitment to the common good. Aaron Douglas Weaver is a doctoral candidate in Religion, Politics & Society and a graduate fellow with the Academy for Teaching and Learning at Baylor University. Weaver received his BA in Political Science and Religion from the University of Georgia and MA in Church-State Studies from Baylor University. He has completed internships with civil rights icon Congressman John Lewis and the Baptist Joint Committee for Religious Liberty in Washington, DC. Weaver lives in Waco, Texas, with his wife, Alexis, and their family. Weaver is a columnist for Baptists Today and blogs at www.thebigdaddyweave.com. James Dunn knows religious liberty, why everybody needs it, and how its corollary—separation of church and state—ensures freedom for all. In this book, Aaron Weaver astutely captures the importance of Dunn’s substantial contributions to these important but often misunderstood concepts. With Americans increasingly confused about religious liberty, this exceptional book reminds us that the work of James Dunn needs to be remembered—by both the church and the state. James Dunn has meant so much to religious liberty in this country, so it is wonderful to have further documentation of just how much in this clear, well-written account. James Dunn has never hesitated to challenge members of any political party when in his view they compromised first amendment imperatives on religious freedom. What a gift he is to the church, the world, and that messy community of dysfunctional, faithful sinners who still call themselves Baptists. What an unruly gift! In the long tradition of religious liberty in America—what Baptists call “soul freedom”—James Dunn has carried a steady flame as both a believer and patriot. He is unique in our time for his courageous opposition to the politicizing of religion and for his many battles in defense of individual conscience. Aaron Weaver has given us an important book on a true Baptist hero. 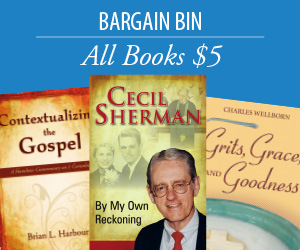 An engaging and authoritative account of a Baptist and American original. This story needed to be told, and Weaver has done so with care and deep understanding. In telling James Dunn’s story, Weaver unfolds much of the evolution of progressive Baptist life for the last fifty years. Dunn, whose cornbread and pot “likker” persona masked a universe of biblical, theological, ethical, and denominational sophistication, is one of the most important Baptists in America for the last fifty years. Aaron Weaver is not only a regular blogger, he is capable of a thoroughly researched and sustained reflection on one of the giants in Baptist life over the past half century. It is altogether fitting for a former Baptist Joint Committee intern (2004) to chronicle the life and times of a former BJC executive director (1981–1999). Weaver does so with both detachment and passion. He tells the James Dunn story with special emphasis on Dunn’s nearly two decades in Washington—including the battle for the Southern Baptist Convention and Dunn’s accomplishments aplenty on the national scene, defending and extending religious liberty for all. I am proud to have labored with both of these Baptists and to call them mentor, mentee, and friends, and I am proud of this book, too. 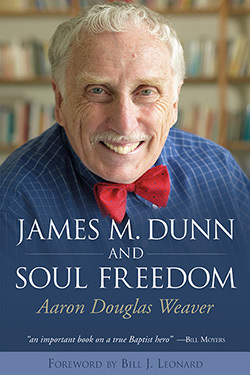 With a “sacred regard for individual conscience,” and a passion for justice, Weaver offers readers a window into James Dunn’s perspective on soul freedom and religious liberty. The work of both James Dunn and Aaron Weaver makes any social activist proud to be a Baptist.